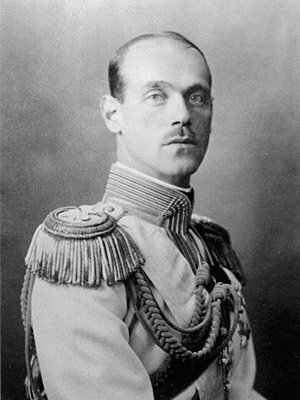 Grand Duke Michael Alexandrovich was the youngest son of Tsar Alexander III of Russia. He was asked to be Tsar after Nicholas II abdicated in 1917 but he never accepted. He was imprisoned by the Bolsheviks and murdered in 1918 at the age of 39. Born on December 4, 1878 at Anichkov Palace on Nevsky Prospekt in Saint Petersburg, Michael was the youngest of three boys with only one younger sister. Like his siblings, he had little real Russian blood in him as maternal grandparents were King Christian IX of Denmark and Louise of Hesse-Kassel. His grandmother on his father’s side was Princess Marie of Hesse and by Rhine). After his grandfather, Tsar Alexander II was assassinated in 1881, the family was moved to the Gatchina Palace which was 29 miles south of Saint Petersburg. It was considered a safer place for the family at the time. Grand Duke Michael while leading a privileged life, did not live opulently at Gatchina. His father was a strict and solemn man who believed in discipline and a plainer life. His younger sister Olga nicknamed him Floppy because of his propensity to flop into chairs; while his elder brother and parents called him Misha. While his father was a arch conservative, he was a loving man and his death when Grand Duke Michael was only 15 was hard on the boy. He joined the military and was attached to the Horse Guards Artillery. Grand Duke Michael was third in line for the throne when Alexander III died but moved up one spot when his older brother George died in a motorcycle accident. At that moment, he was next in line until Nicholas and his wife Alexandra gave birth to the Tsarevich Alexei. Michael’s romantic life was somewhat scandalous as he married a lower class woman, Natalia Sergeyevna Wulfert. Because of this, Nicholas II stripped Michael of his standing in the family and banished him from Russia until the outbreak of World War I. Grand Duke Michael was a highly respected and popular military leader, unlike his older brother. He served his country well despite their woefully poor army. After the revolution caused his brother to abdicate, Michael was arrested on August 21, 1917 but released soon there after. On March 7, 1918 he was rearrested and executed on June 13th. He was the first of the Romanov’s to be murdered and certainly not the last.